It is very hard to generalise about how divorce or separation affects children as each child's experience is different. That is a very important point to remember throughout this issue – no two children's experience of divorce or separation is the same. Even if you have twins who are mirror images of each other in every way, you, as the parents or related professionals working with the children, must not assume that just because one child feels one way then the other will too. It is imperative that parents, carers and other professionals that work with children appreciate that reactions to and the impact of divorce or separation on each child is a very personal situation. 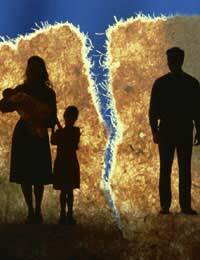 There is no 'one size fits all' response to dealing with or supporting children who's parents are going through a divorce so each child in each case must be handled individually in order for the child to be able to 'come through' or at least deal with their parent's divorce as positively as possible. Perhaps it is important to point out that divorce or separation is not always the worst thing to happen to a child; it's not always the thing they dread most. Sadly, many children see their parents enduring a bad marriage, perhaps involving substance abuse or violence or adultery, so the prospect of an end to the arguments, bad atmosphere or worse can actually be a welcome relief. Now, it doesn't often start off a relief and it can just seem like a bad situation just got worse, and it certainly isn't someone else's place to say that 'this is a blessing in disguise' or some other trite comment, but it could be the start of an improvement for some children and families. The affect that divorce or separation can have on children is pretty much always tangible, both in good and bad ways, but often, as long as the professionals around them are vigilant and intuitive, it can be supported and managed with the right advice. As a person working with kids, it is certainly likely that you will come across children who fall into a number of categories, including parents who are currently going though a divorce, parents who are recently separated or parents who have previously divorced or separated and the child is still going through a difficult time. While you cannot replace their parent or be too much of an emotional crutch when you are employed in a professional capacity, your role as a permanent adult fixture at that point in their life is an important one. For teachers, teaching assistants and other professionals working with kids in schools, it is crucial that you create a trusting atmosphere where children know they can talk to you in confidence. This obviously must not undermine your professional role, but if you can make it so that children know you are a reliable, trustworthy listening ear who has their best interests at heart, you will be in a good position to support and understand the issues the children in your care may have regarding their parent's divorce. A good way to make this clear is to regularly talk to your class or individual students you are responsible for about the fact that you will always listen to them and any concerns they may have. Make yourself accessible too – don't dash off after every class or make it so that you are always talking to another teacher at break or lunch time. Be visible – be in your class ten minutes early so that you're there if someone wants to talk. Working with kids during out of school activities puts you in a very responsible role. Not their teacher yet not their parent, you will be a key figure in the child's life. This position of responsibility needs to be treated with respect, particularly at a time when children can be very vulnerable. The best way to offer support and understanding to children whose parents are going through a divorce or separation is to show that you are a person they can trust. While you cannot overstep the mark with regards to your role, there are less clear cut guidelines for people working in out-of-school clubs than teachers, so you will need to tread carefully while still being available. It may be the case that the child comes to you for support. You must be clear that you are happy to listen to them talk and that you will advise where possible. It is also a good idea to suggest ways in which the child can gain professional support as this is likely to be outside both your remit and your skill set, so you do not want to give bad or even potentially damaging advice at this difficult time. Signposting children to other support networks such as a child psychologist is certainly a good idea, but it is best to be aware that this can seem like 'passing the buck' to a child that is likely to already be feeling rejection. Talk as an adult and be appropriate, but be clear that you can be more of a listening ear than any kind of professional support. Thank you for sending this to me. As a child I was very affected by my parents divorce andsubsequent events in my childhood .I suffer with depression and anxiety and feel that even though I am now 52, events in my childhood have contributed to the way I am. I have worked with children for over 25 years and Icare very muchabout children's emotional wellbeing and levels of self esteem . I am undertaking my level 3 Children and Young People's Workforce Diploma andthe information you sent will assist me in my course. Thank you.